If you are going from JFK to Newark or Newark to JFK there are a number of travelling options available. You could take the train from airport to airport, the only problem is that you would need to change twice. If you have luggage and little time, then this is not advised as you also need to buy three different tickets for this journey. Should I take a Taxi? Taking a taxi is a better option but I would advise against it. Because JFK is located in the state of New York and Newark in the state of New Jersey, taxi drivers can charge a special rate. They also often drive through Manhattan where it can be very busy and will cost you even more. If you do take a taxi then expect to pay at least $140 + toll (around $15) and tip. Therefore I suggest booking a car service online in advance. This is also a good option if you are travelling with more people as you can book a Van for up to nine passengers. If you would take a taxi, you would need two to three taxis. Booking a car service online beforehand is not only cheaper but will save you a lot of time and stress. 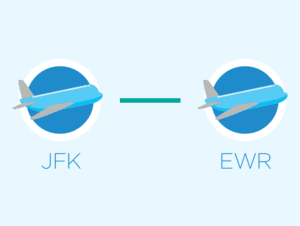 When booking this private inter-airport transfer from John F. Kennedy International Airport (JFK) to Newark Airport (EWR) or vice versa, you will need to fill in your flight details to complete your reservation.